The world of marketing at enterprise companies is both exciting and challenging – there are many decisions to make and options available when it comes to which marketing channels to prioritize, which technology platforms to utilize, and when to hire an agency for support. 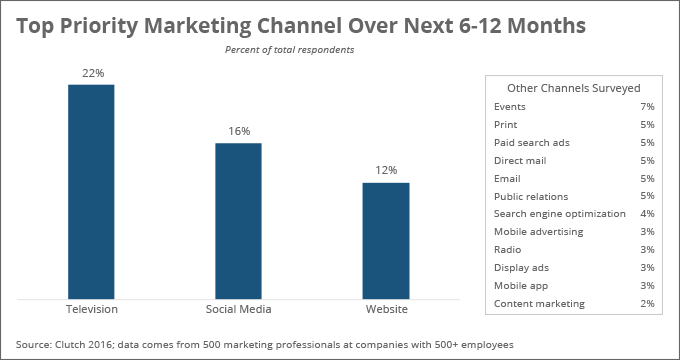 Enterprises rely on multi-channel campaigns, using an average of eight different marketing channels. TV advertising is a key priority for enterprise marketers and the largest opportunity for agencies. 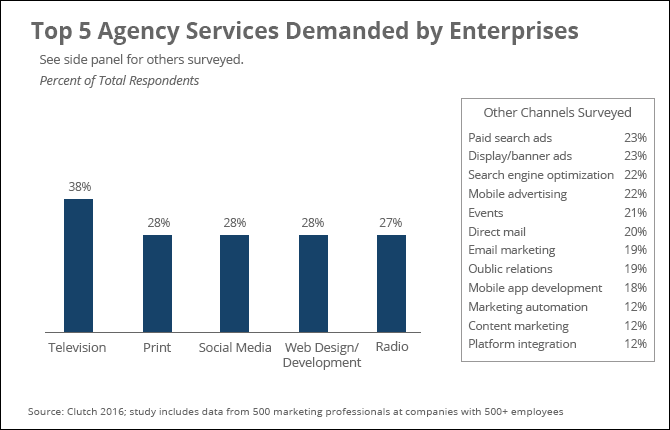 Agencies are in high demand – particularly ones that specialize. Centralize command of your marketing campaigns under either a lead agency or strong in-house leadership. Look to specialists to supplement those efforts. Do not discount traditional methods such as TV advertising. In addition, ensure you have the digital channels in place to capture the online demand that TV ads generate. Invest in analytics to optimize your campaigns and track return on investment. 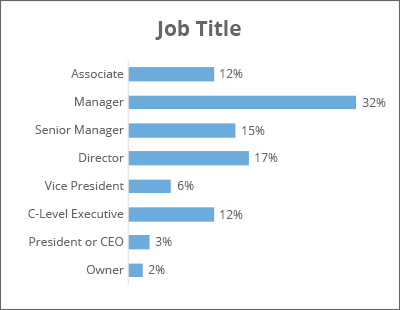 We surveyed 500 respondents who work in a marketing role at companies with at least 500 employees. About half come from companies with 1000+ employees. 88% are manager level or higher. More demographics can be found at the bottom of this page. R2i created infographics from the data that can be found here. Our survey began with exploring which channels are most popular for enterprise marketers and the breadth of their marketing programs. 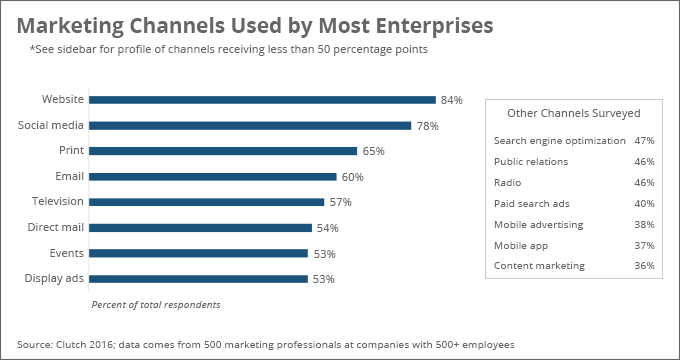 On average, enterprises use eight different channels to market their businesses. Most popular mediums are website, social media, and print. As the consumer decision journey becomes increasingly complex, marketers must create sophisticated, multichannel campaigns to attract and retain customers in all different stages. It is likely that our study does not even capture all that the modern enterprise marketer works on today. This new, complex marketing landscape poses a challenge for CMOs to develop cohesive campaigns with a consistent brand image and message across platforms. 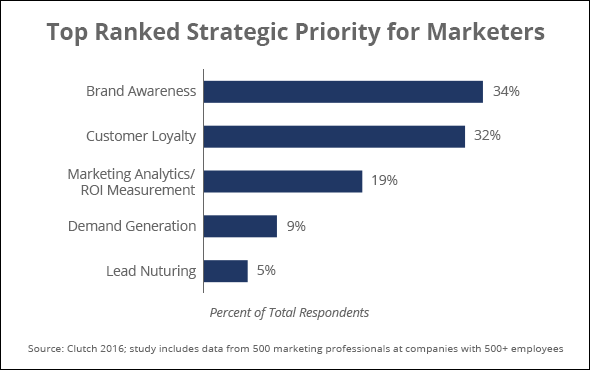 In order to do this well, enterprises should have either strong in-house marketing leadership or a primary agency at the center. Either of these central bodies can then maintain control and measurement over specialized agencies that take pieces of the company’s marketing campaigns. “The advantage to keeping all channel campaigns and management under one roof is for consistency across branding, customer experiences, messaging, and measurement as well as efficiencies of scale with regard to creative assets and channel activation. It also allows the CMO to spend substantially less time managing multiple partners and more time focused on campaigns that achieve maximum results." 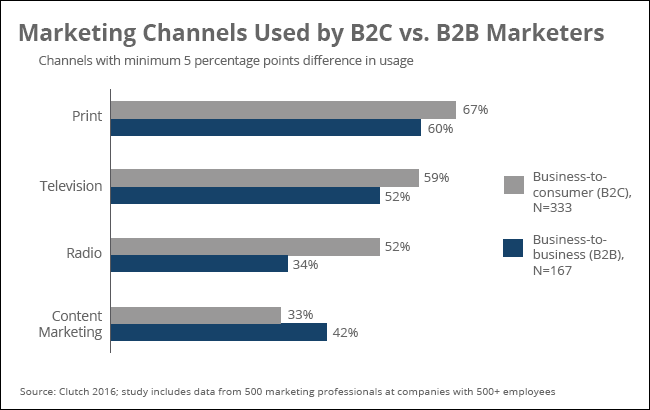 Traditional channels like print, TV, and radio are more common among B2C marketers, whereas content marketing is more popular in B2B. There are distinctions in the type of buyer making a consumer purchase as an individual versus making a significant business purchase on behalf of a company. 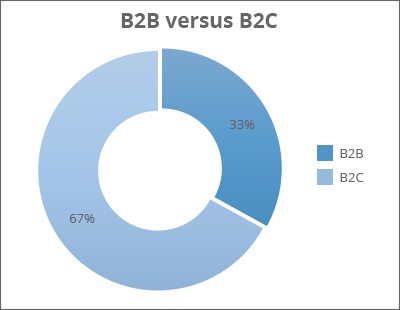 The B2B buying and subsequent sales cycle is complex and typically longer over time which requires a long-term focus on nurturing the buyer across more touchpoints and really capitalizing on the moments that matter. To make an impact marketers must be laser focused on targeting their message within the channels that will be most effective at reaching and convincing their buyer type. “The B2C customer is everyone. Whether its groceries, clothing, insurance, travel, or medical purchases, every individual fits into some B2C audience segment. On the whole, traditional channels still provide reliable access to these buyers. TV emerged as the most common number-one ranking, selected by 22% of companies. The top three responses above are the same across both B2B and B2C respondents: TV, social media, and website. Why is TV so important? Marketers continue to invest in TV, despite conflicting advice to move towards digital; in a 2016 survey by RSW/US, marketers expressed that their agencies often downplay the importance of traditional media and put too much weight on new media. TV remains one of the most trusted and actionable forms of advertising, according to a 2015 Nielsen study. Globally, 63% of consumers say they completely or somewhat trust TV ads — the highest level of trust in any paid advertising format surveyed, both online and offline. In addition, 69% say they always or sometimes take action on TV ads. Brand awareness is a strong benefit of TV advertising, so these findings are likely correlated. TV can drive the brand message at the root of a multi-channel strategy. “TV is a great medium for storytelling even if it’s only in 30 second spots. It allows a brand to make an emotional connection with the audience and when done right will also deliver a continuous experience across other brand properties. TV is a high driver of searches and social engagements giving marketers an immediate correlation between their TV spot and customer actions." Are marketers taking full advantage of TV? It is essential that TV advertisers round out their campaigns with digital channels such as search and social that can fully capture all of the online traffic that is triggered by TV ads. Just 47% of companies report using search engine optimization, the remaining losing out on a piece of that demand. It is crucial that businesses both plan for online traffic following TV ads and use digital channels to reinforce their message. The good news is that 84% of enterprise companies have a website and 78% use social media. But, it is not clear whether those companies that advertise on TV are truly integrating the customer experience across all the platforms where they meet customers. When done correctly, this integration will reinforce the message and maximize the value companies receive from TV advertising. We found that 38% hire an agency for TV advertising. This is by far the most popular service for which to hire an agency – 10 percentage points higher than each of the next three most popular (print, social media, and web design/development). This is likely correlated with the large number of companies that invest in TV advertising – but even more, TV ads require a level of sophistication involving specific skills and high-end equipment that is often best left in the hands of specialists. Additionally, the world of TV advertising is evolving quickly, and advertising agencies often have an edge over in-house teams given their close-up view of the industry and experience with many different clients. In a recent Ad Age article, Brad Jakeman, president of the global beverage group at PepsiCo, explained how the pace of content production has evolved, creating new challenges. “For a brand like Pepsi, it was once sufficient for us to produce four pieces of content a year—mainly TV—and we could spend about six to eight months developing that one piece of content and spend $1 million on each piece of film. Now, that four pieces has turned into 4,000; eight months has changed to eight days and eight hours; and budgets have not gone up,” said Jakeman. Enterprises that face these pressures yet still want to tap into the benefits of TV advertising can turn to experienced ad agencies to manage this complex piece of their marketing program. Our study also addressed how enterprise companies work with agencies more broadly and how those relationships are changing. 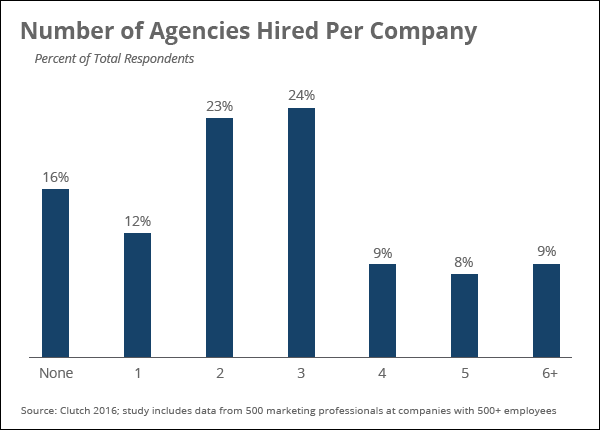 We found that 84% of companies hire at least one agency for a marketing or advertising service—and more commonly work with 2 or 3 agencies. This is not surprising given all that a CMO hopes to do today, with the diverse technological skills and knowledge required for sophisticated multi-channel campaigns targeting multiple audiences. Given this dynamic, both internal and external resources are a necessity for businesses of this size. 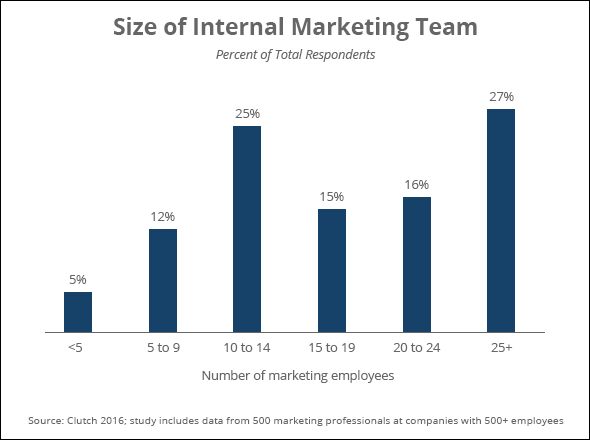 We also looked at the size of internal marketing teams for perspective. A model where the in-house team implements campaigns and builds up knowledge yet leans on the expertise of outside specialists or agencies seems to be common. Marketing teams can fill in the gaps with agencies that best suit their business needs. “Agency partnerships allow CMOs to supplement their team where needed; it could be strategic, tactical, a combination of those, or it could be that the agency serves as an entire department within marketing, i.e., digital or demand generation. 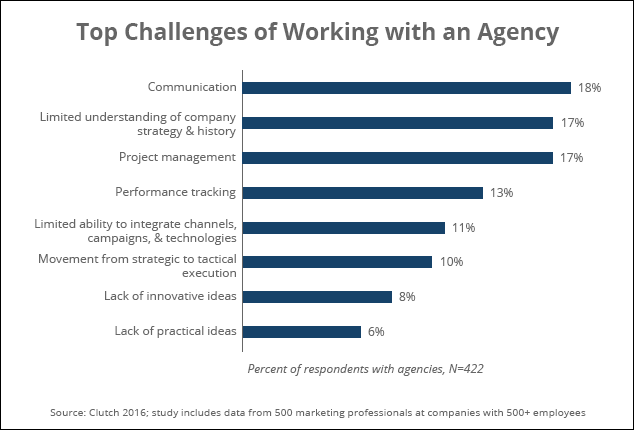 The agency landscape of systems integrators, consultants, digital-only, niche and boutique, global, and full-service agencies gives the CMO plenty of options. At the root of the decision regarding what type of external resource a company should hire is whether they prefer to work with a large full-service firm or a best-of-breed specialist firm. At one end of the spectrum, massive agencies and holding companies continue to grow in territory—Ad Age’s Agency Report 2016 states that the ‘Big Five’ agencies completed over 100 acquisitions and investments in 2015. And, smaller specialist agencies can also be very successful with enterprise brands, especially in areas that require deep technical expertise such as custom mobile app development. There are even small consultants in niches such as company and product naming that dominate the enterprise space and act as subcontractors to larger branding firms. Both full-service and specialized agencies have their pros and cons. Over the life of a business, it is common to cycle between a preference toward one or the other. 54% of marketers in our study say their companies are strongly or somewhat trending toward hiring additional, specialized agencies. 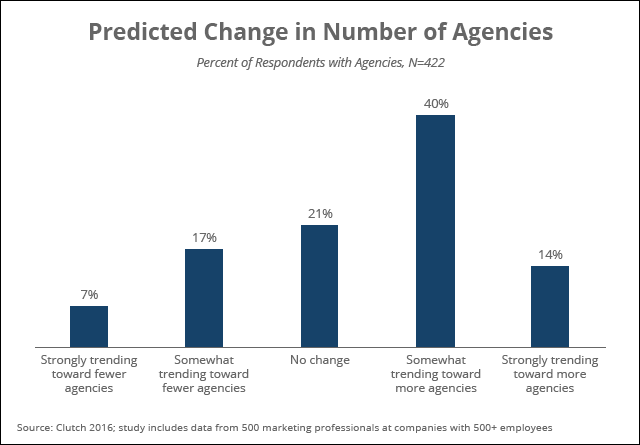 Just 24% say the opposite: their company is trending toward fewer, full-service agencies. The trend towards specialization is likely indicative of all the new areas of marketing and technology that are emerging. It is a lot for an in-house team or any one agency to keep up with. "Companies are looking for specialized help within a fast-changing, complex world. People that understand technology and analytics in particular are in demand. Within our surveys, we've seen that marketers are looking to specialize. 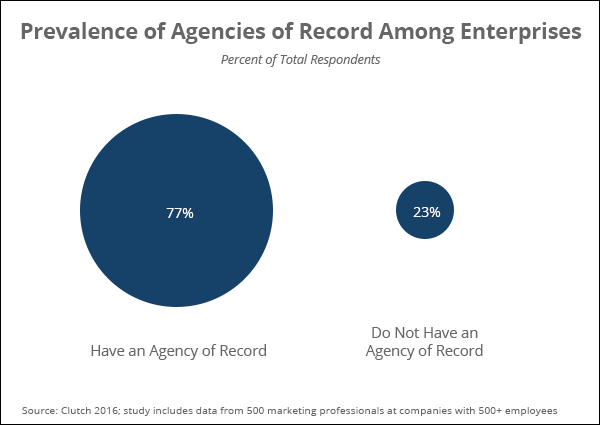 Traditionally, Agencies of Record (AOR) were common in the enterprise space. Specialized marketing technologies or niche industries require deep knowledge that a full-service firm may not address. There is higher agency competition in the market and businesses have more options. 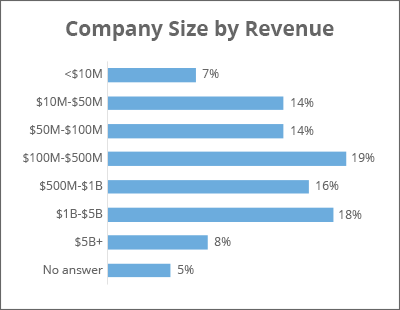 However, in our survey, 77% of companies indicated that they have an AOR. We suspect that while the title AOR might still be used, the AOR today is more flexible than its predecessor. The traditional AOR opportunity is becoming more and more rare. The modern AOR model is likely that of a “lead agency”, where one central AOR works closely with a company over the long term so that it understands the company’s strategy and history. Specialist sub-agencies overseen by the AOR then complement the AOR’s capabilities. “Ideally the AOR understands the brand mission and how that connects to the demand gen campaigns being run and the technology used to activate, manage, and optimize those campaigns. Without an AOR in place, brands run the risk of operating in silos, lose time-to-market, and miss the mark on delivering a truly integrated experience for their customers. For enterprises, relationships with agencies seem to be a necessity for their marketing programs. Three responses emerged above the rest: communication, limited understanding of company strategy and history, and project management. Although these difficulties may stem from a lack of “soft” client skills as opposed to a lack of technical or creative skills, there are still learned practices and policies that agencies can use to mitigate these challenges. “[The best agencies] are transparent up front in their sales cycle about everything from their capabilities to their deliverables and the teams who will work with the client. Executive sponsors are a typical role to hold the client team accountable and help ensure client satisfaction along with dedicated account managers responsible for serving as a daily point of contact. At the end of the day, it’s about relationships, and all great, successful long-term relationships are built upon adjusting and shifting during the challenging times, not necessarily maintaining status quo during the good times." In any case, our survey shows that enterprises find agencies valuable on the whole, given that most hire between one and three agencies, and the majority plan to hire even more in the future. In addition to agency resources, marketers turn to technology products to support their campaigns. 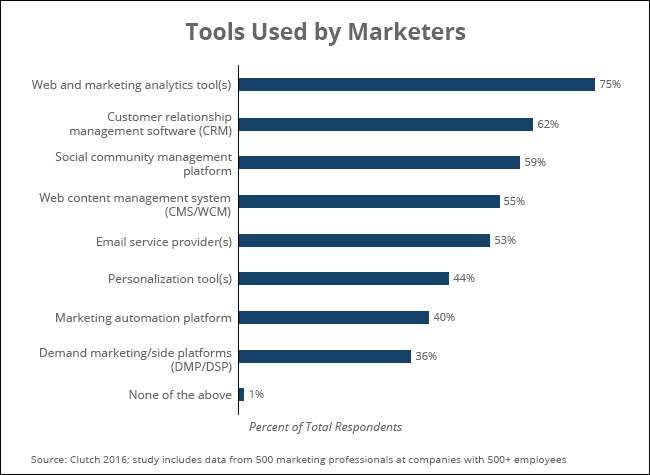 Virtually all marketers use at least one type of marketing software. The most common tool is analytics software, used by 75% of enterprises. Analytics is critical for optimizing and tracking the success of marketing campaigns, especially digital marketing. It is a little surprising even that a quarter of enterprises do not use it. “More CMOs are responsible for building their marketing department to function as a profit center and show ROI [return on investment] on things like technology and multi-channel campaigns. Without a way to capture, aggregate, and visualize data, CMOs lose the ability to justify their investments. As a follow up, we asked which tool their company relies on most heavily for marketing execution. 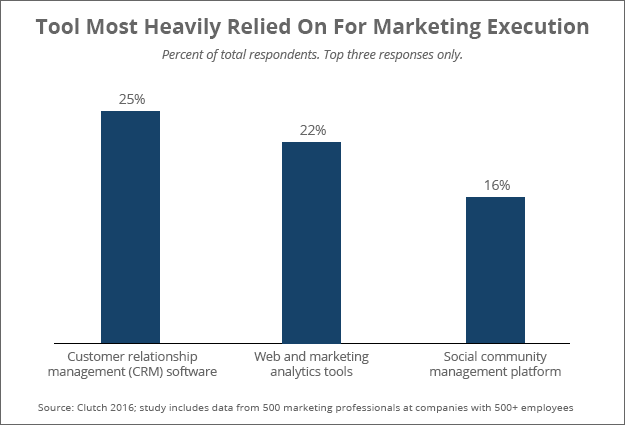 Customer Relationship Management (CRM) software is relied on most by 1 in 4 marketers, followed closely by analytics software. CRM tools are critical in managing the leads that the business generates through all channels. At the end of the day, analytics and CRM software can be useful no matter which marketing channels your company uses. Enterprise marketing is an exciting space to be in with all of the technologies to learn and channels to explore. Marketing teams have plenty of options at their disposal whether it’s which channels to invest in, which agencies to hire, or which technology solutions to use. The challenge will be orchestrating the right mix of these resources as the industry continues to surge forward with innovation. Clutch and R2i’s Enterprise Marketing Survey consisted of 500 respondents who work in a marketing role at companies in the United States with at least 500 employees. 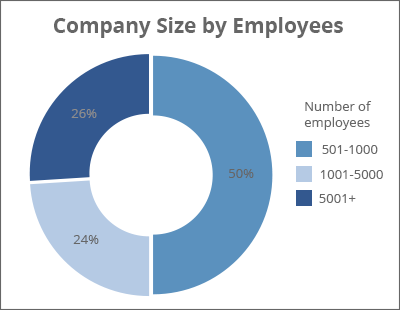 About half come from companies with 1000+ employees. 88% are manager level or higher. Responses were collected between March and April 2016. R2i's full take on the survey including summary infographics can be found here. Graphs from our survey can be downloaded from Dropbox. Want more information or data points from our survey? Contact [email protected].